1. 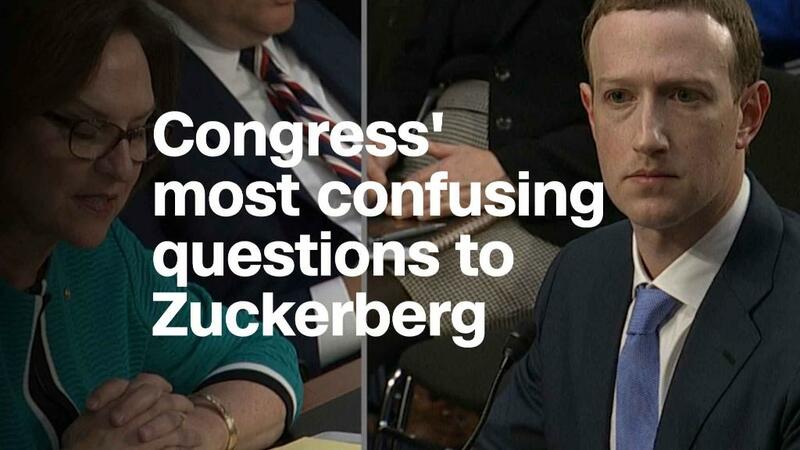 Facebook faces Wall Street: Mark Zuckerberg survived 10 hours of grilling by nearly 100 members of Congress this month. Now, Facebook's CEO must confront a group that could actually punish his company in the short-term: investors. Facebook (FB) is set to report its first-quarter earnings after the bell on Wednesday. Zuckerberg will then field questions on a conference call with analysts for the first time since the Cambridge Analytica data scandal upended the company and shaved tens of billions of dollars off its market value. Much is at stake. GBH Insights analyst Daniel Ives called this earnings report a "pivotal barometer" for investors in a research note Friday. It will be a "key step for investors to either boost their confidence in the Facebook story going forward or raise further red flags," he wrote. The consensus estimate among analysts is for Facebook's sales for the first three months of 2018 to hit $11.4 billion, up more than 40% from the same period a year earlier. But that only tells part of the story. Analysts are concerned about how much an ongoing backlash among users, advertisers and politicians on both sides of the Atlantic could slow down a company once viewed as unstoppable. Brian Wieser, an analyst with Pivotal Research, predicts there will be "an ongoing erosion of usage throughout 2018" due to "reduced trust" and "increasing awareness of toxicity of the platform," among other factors. He also expects marketers to rethink the upsides of advertising on Facebook because of the potential privacy concerns from consumers. Ives thinks the "worst case scenario" is that as much as $2 billion in ad sales could be "at risk" for the company this year. So far, Facebook executives have played down concerns. Zuckerberg said an online campaign to delete Facebook has not had a "material impact" on the company. Facebook chief operating officer Sheryl Sandberg said only a "few" marketers have paused their advertising on the platform. Expect them to be grilled about both points on the earnings call — as well as how much Facebook is spending to make things right. Zuckerberg has said Facebook will conduct a costly audit of thousands of third-party applications and hire more security and content review staff. The cure could end up being worse than the disease — at least for Facebook's bottom line. 2. Starbucks fallout: Facebook isn't the only company that will have to answer for a major scandal when it reports earnings this week. Starbucks (SBUX) will probably face questions about the uproar around the arrest of two black men who were waiting for a third person at one of the coffee chain's Philadelphia stores. CEO Kevin Johnson said the arrest "should not have happened," and the company has planned racial-bias training for 175,000 employees next month. 3. First quarter US growth: The Commerce Department will release its initial estimates for first-quarter economic growth on Friday, and expectations are pretty low. Analysts surveyed by FactSet are expecting just 2.2%, down from 2.9% at the end of last year. Barclays (BCS) last week cut its forecast to just 1.5%. This may have something to do with what the San Francisco Fed once called the "puzzle of weak first-quarter GDP growth," suggesting a statistical problem with how the government measures growth early in the year. The problem leads experts to believe that growth could rebound in the following quarters. But Barclays and others are also predicting low growth because Americans just haven't been spending as much. Consumer confidence hit a 17-year high in February, but retail sales were disappointing in January and February. They picked up a bit in March. 4. Market calm: The stock market has settled back down. Wall Street's anxiety about a trade war with China has faded for the moment, allowing investors to focus on healthy corporate profits and the boost from corporate tax cuts. "It's one of the gifts we get from earnings season," said Art Hogan, chief market strategist at B. Riley FBR. The Dow gained 0.4% last week, its smallest move in either direction in two months. The S&P had its quietest week since the end of last year. But the market may soon have to worry about an old nemesis: inflation. Commodities, including oil and aluminum, are spiking, putting pressure on business' costs. Tariffs may be playing a role, too. The yield on the 10-year US Treasury bond, which had been falling as expectations of inflation eased, is back up to a three-year-high of 2.96%. 5. Tariff and tax impact: Two big trends to watch this earnings season are tariffs and taxes. As first-quarter earnings roll in, watch for what companies have to say about President Trump's tariffs and about the benefits of the corporate tax cut enacted late last year. A slew of large companies should give us some idea when they report this week: Alphabet (GOOG) and Whirlpool (WHR) are coming on Monday. Caterpillar (CAT), Coca-Cola (KO), Lockheed Martin (LMT) and Verizon (VZ) follow on Tuesday. AT&T (T), Boeing (BA), Facebook (FB) and Twitter (TWTR) report on Wednesday. American Airlines (AAL), General Motors (GM) and PepsiCo (PEP) are on Thursday. And ExxonMobil (XOM) is reporting on Friday.